Japan is one of the world’s most literate societies. Its national newspapers are the most read newspapers in the world, and the country also has a very vibrant local newspaper sector. This book assesses the vital role local newspapers play in the development of local communities, as well as examining their development, industry structure and production conventions. The author employs the key term, ‘revitalization journalism’, to explore in detail the many techniques and conventions that local newspapers employ to engage with, and make an impact in, their specific host regions. 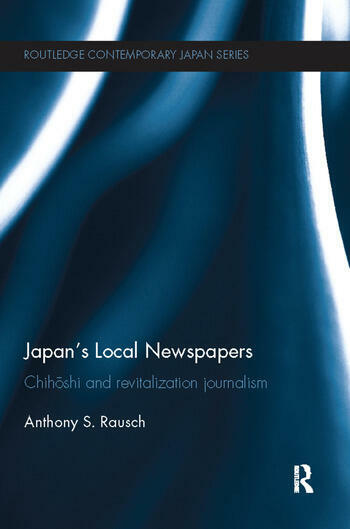 The book concludes by comparing Japanese local newspapers to the current state of newspapers worldwide, and assessing how Japanese local newspapers are likely to develop in future. Anthony S. Rausch is an Associate Professor in the Faculty of Education at Hirosaki University, Japan.